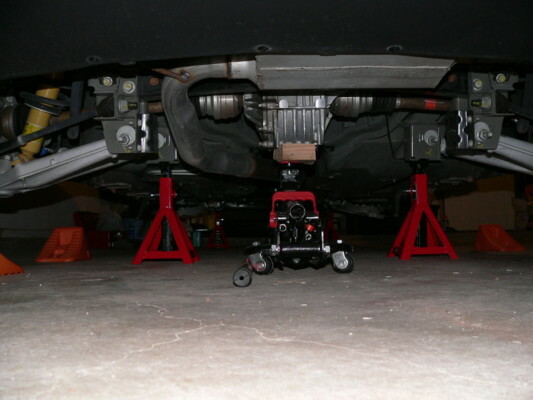 Okay, here are the pics of how I lifted the front on the jack/jack stands. The pictures are of the front passenger side of the car. The first pic is where I placed the jack stand. I used the flat area behind the front wheel. There are two holes in this plate which seemed to line up pretty well with the two "tips" on the jack stand and it looked sturdy enough to support the weight of the car, so that is what I decided to use. Where to place the jack was a little harder to decide. Due to the small size of my garage, I lifted the car one "side" at a time to paint the calipers, rather than lifting the front or back completely. So I placed the jack at the front "knuckle" or joint where the control arm meets the frame, so that only one wheel was raised off the ground. 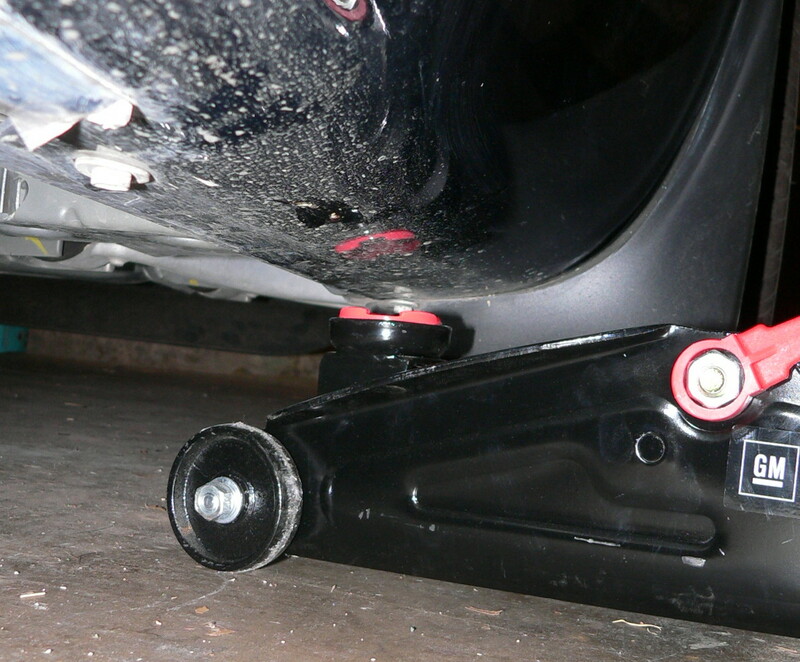 If you are lifting the front and want a centered location to lift from so that both front wheels come up off the ground together, you should probably place the jack under the forward frame member, centered between the two knuckles. Thanks, dengel! I think you've done exactly opposite of what I had planned on doing. I had thought I would jack where you put the stand and put the stand where you jacked. THeoretically, either should work. Bottom line, the visual learner is happy! or you could go hog wild and jack the front end from where the GM paper shows you...those little bitty spots level with the hinge on the doors. i used a small piece of plywood to keep the jack from damaging the bodywork where it curls under, or you could get those "puck" inserts they use on the Vetts. It appears to me that the GM paper has you JACKING at the knuckles where dengel did and LIFTING on those pads where she placed her stands. It is that uncertaintly in those sheets (you see one thing, I see another! ) that prompted me to call for the pics. I'll use something between jack and car regardless. I'm thinking of making a "puck" from a great big laboratory stopper. Being a chemist has got to play in here somewhere. 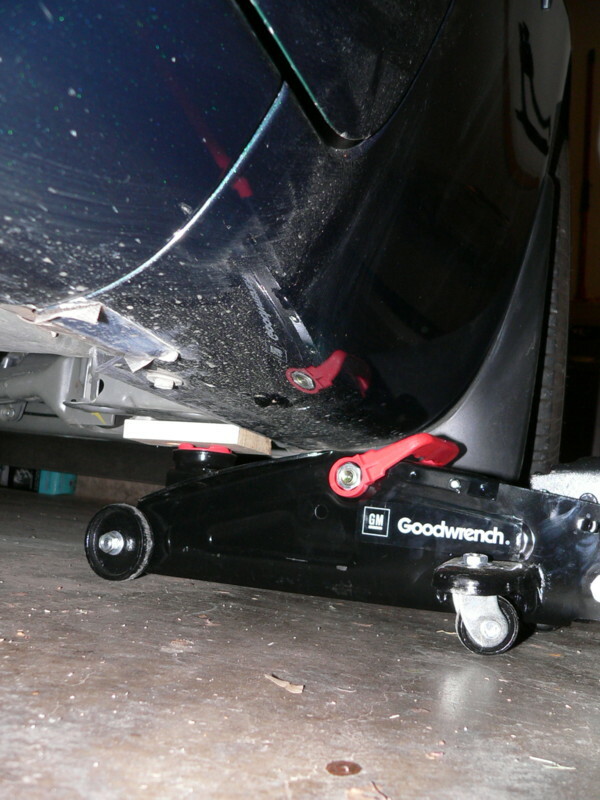 I can add something here (value to be debated) - according to the dealer that damaged my car when lifting (take the rest for what its worth) where the jack stand was placed in dengels lift is indeed the recommended lift point, their explaination was the tech didnt use the lift arm extension that provides the adequate clearence of the fender. So again for what it is worth Chemist I do think you are interpreting the GM paper and the the jack stand location in that picture is where GM recommends lifting from based on my very sorry service manager. Hey, Chemist, I had the same problems as you did interpreting the "instructions" from the GM document. So I just interpreted it as best as I could and tried to choose points that I at least recognized so that I wouldn't accidentally punch a hole through the oil pan or something. Hence my "disclaimer." Thanks again for the pictures Dengel, no doubt we are all finding our way through this together - that is the wonderful thing about this forum. As you said, your selection of jack and lift points worked without causing any damage - More then my trained service department full of mr. goodwrench wannabes can say. Understood and appreciated! THe entire thing would have been much easier for me had I had PICTURES from GM rather than a diagram. It took me a minute to figure out which end of the car was which (yes, I know, I'm new to being a "car person". ). Anyway, let me echo ripple once more and give you my thanks for your pics and advice. Chemist, If it is painted green don't use it as a jacking point! I jacked my rear up by the carier, and put the stands under the wheel struts. Front I jacked by the engine cross member and put the stands on the frame. Stay away from the body panels and you will be fine. Thanks! I've never had a car before that did not explicity tell this poor mechanically disinclined soul exactly where to put the jack. I feel confident now I can get my mods done and get Muirne back to earth safely. Done!! I got off work early today and decided I would put Muirne up on stands and paint her calipers, apply decals to them, clean the wheels, and rotate the tires. 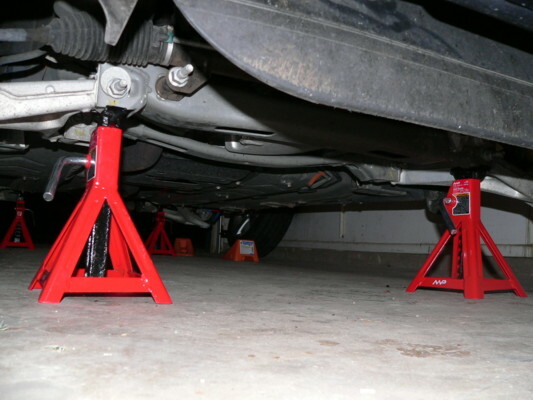 Below are pictures of the jack stands in place. I used the front lifting points (behind the front wheels) to raise the front end and the differential to raise the rear. Thanks to ALL who were so kind to offer me your input/advice/help to get this done! Can you take some pics of where you jacked it up from the front please? Does this show what you need to see? LMK. We shop at the same store. 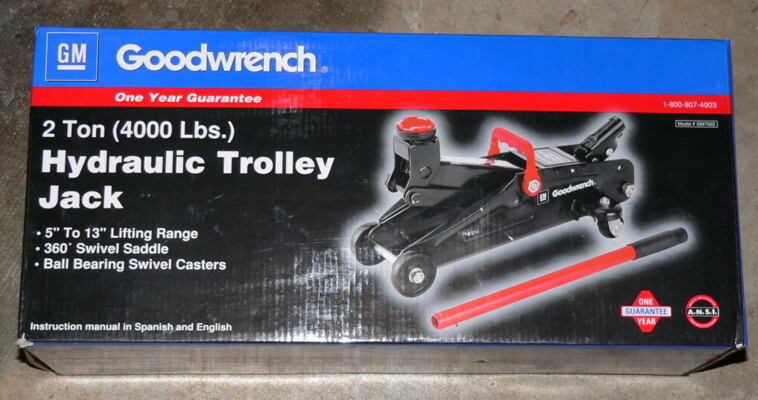 I had to get a lower floor jack and got the same one as you. It works great under a "low Sol." According to the pdf file picture of jacking and lifting points that is not either, although I have used it with some makeshift wooden blocks also and it seems OK. I have found the pdf file to be less than clear. A new look just now confirms that you are correct (as far as I can see! ) But, as you say, the position I used works.